Imman too hopes to score music for a Hollywood movie one day. 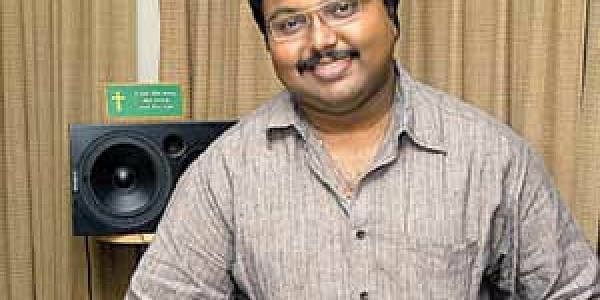 CHENNAI: Like any other music director, Imman too hopes to score music for a Hollywood movie one day. But the music composer, whose popularity is soaring by the day in Tamil, wants to concentrate on the present first. &quot;My schedule is pretty hectic all the time, because I take charge of song programming and mike setup, apart from composing tunes,&quot; he says. Imman was just 15 years when he scored music for his debut film 'Kadhale Swasam'. The film, unfortunately, never hit the screens. &quot;My second movie was 'Thamizhan' and I was only 19 then,&quot; informs the musician who says he started romancing the keyboard at a very young age. &quot;Even when I was in school, I used to go for recording and then the serial 'Krishnadasi' happened. After scoring music for number of serials following that, I got a chance in films. It was quite easy for me to enter Kollywood but staying here is what matters and what is the challenge,&quot; says the music director, who is a great fan of&nbsp; loves A R Rahman's compositions from Roja to his recent Slumdog Millionaire. &quot;When maestro Ilayaraja’s 'Thiruvasagam' was launched, he called all the composers and I was the youngest of them all. My most memorable moment was when Rahman sir came up to me and asked me whether I was Imman. Ace musician MS Viswanathan sir also told me my title songs for serials were good,&quot; says Imman, who prefers melody songs to the kuthu songs that he is so famous for. &quot;In today’s commercial cinema, it’s very hard to get a chance to score melody songs. Everyone prefers fast beats and I have done only a few love subjects. I can try out different genres if I get a chance to compose music for love stories,&quot; says Imman, who hopes to score music for an Ajith film one day. “My entry into serials and films was because of Kutty Padmini. I saw GV at the audio launch of Kutty Pamini’s 'Kadhalae Swasam' and that's how 'Thamizhan' happened,” says Imman, whose title songs for 'Kolangal', 'Kalasam', 'Sivashakthi', 'Vasantham', 'Bandham' and 'Thirumathi Selvam' are on air. “I’m composing music only for title songs of serials and that, of course, gets played for a whole year,” giggles Imman, who says he has high comfort levels with directors Selvah and Manoharan. He has also scored music for Bollywood movies - 'Kis Kis Ki Kismet', 'Khwahish' and background score for 'Garam Masala'.